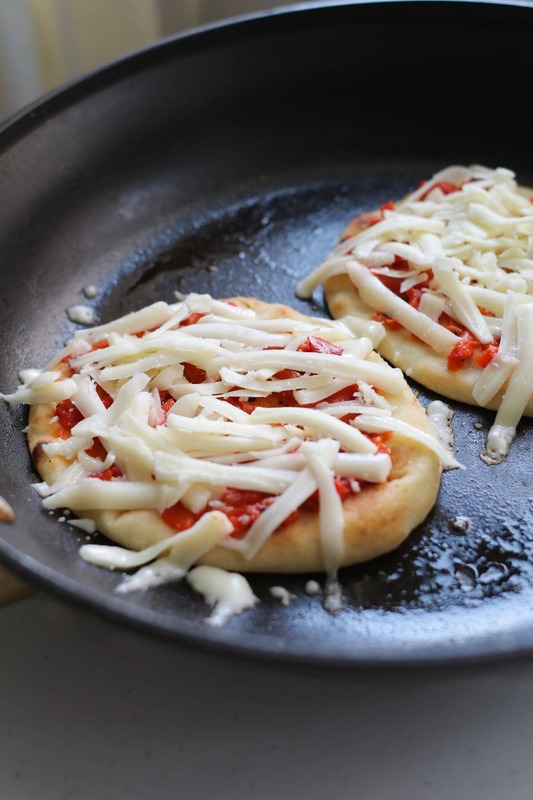 Easy Skillet Pizzas: you’re only 5 ingredients and 5 minutes away from a delicious dinner! 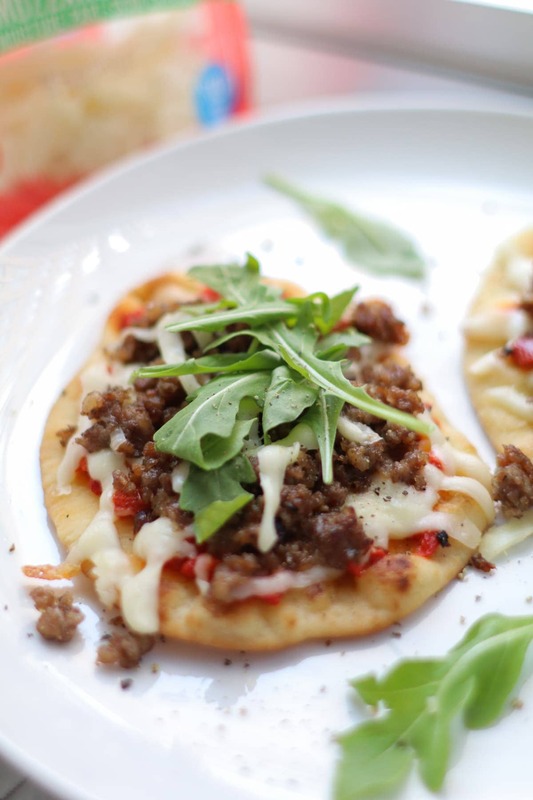 Toast up some mini naan bread and add your toppings for a tasty and super speedy dinner. Thank you Borden® Cheese for sponsoring this post. All opinions expressed are my own. Calling all busy people everywhere! If you are running nonstop all day everyday and end up tired by 5pm (or 3pm like me!!) but you still like to gather your family around the table to eat delicious food, you’ve come to the right place! Skillet pizza is the cheater, busy parent, short cut dinner that you need in your life. 5 main ingredients, 5 minutes of cook time and voila! A fancier, but healthful and filling dinner that everyone will love. Yes, life can get in the way of a well-planned homemade dinner, but hopefully this recipe will help solve that dilemma. Pizza is normally a Friday night thing at our house (who else does Pizza & Movie night?) and that’s when we like to experiment with new pizza flavors, toppings and cooking methods. I love making this absurdly quick version of pizza because the naan bread used as the crust gets toasty on the bottom, just like it would in the oven, but cooks much quicker because of that nonstick skillet. I also love using Borden® Cheese Thick Cut Shreds because they’re made with the freshest ingredients, they melt extra smooth and you don’t need as much to cover a larger area. Each serving provides an excellent source of calcium plus 6 grams of protein, so I can feel good about feeding this to my family. 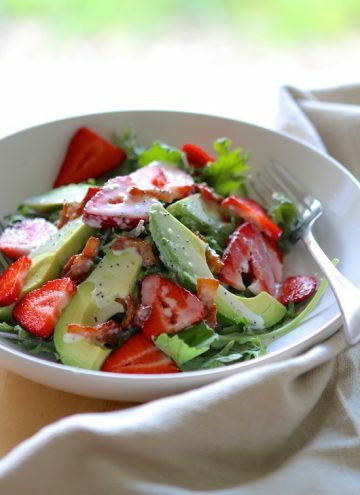 Finding nutritious, easy to make weeknight meals can be quite the challenge. While experimenting in the kitchen with a new recipe is fun, it’s difficult to find the time between life’s busy schedule. 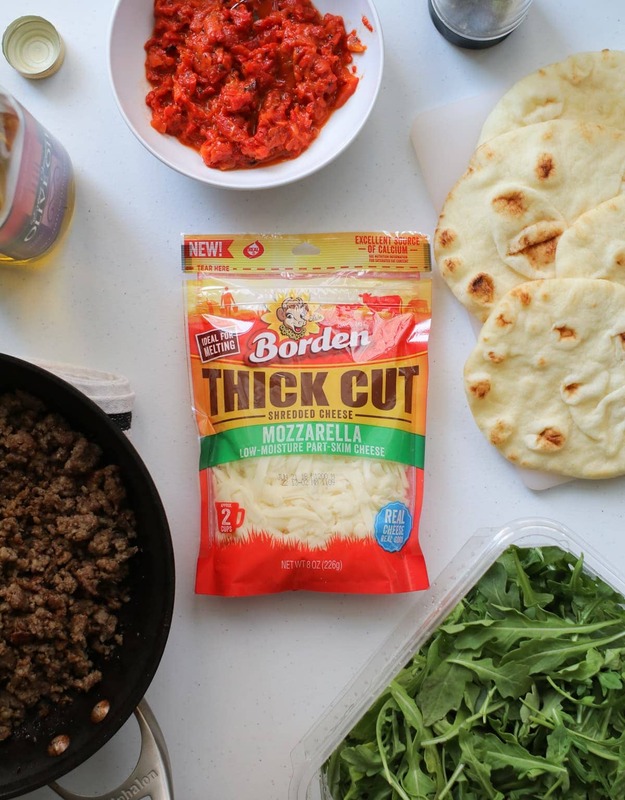 Borden® Cheese knows for most families, it’s all about quick and easy meals that are not only tasty, but nutritious, as well. 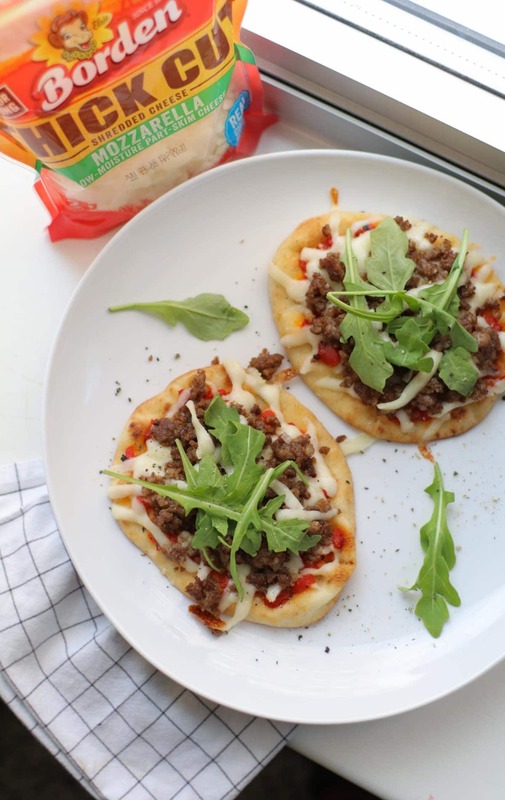 These skillet pizzas are a wholesome, convenient meal that will be enjoyed by anyone, allowing you to spend more time with your family around the dinner table and less time in the kitchen. 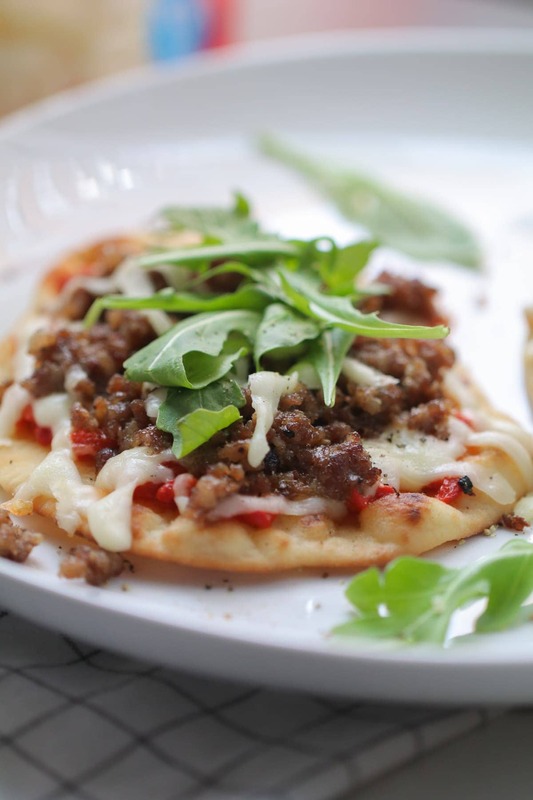 The main ingredients for my pizza include: naan bread, roasted red peppers, pork sausage, mozzarella cheese and arugula. Feel free to switch out the roasted red peppers for marinara or pizza sauce and the sausage for other common pizza toppings. There are so many ways to switch this up, while keeping the cooking method the same, so make your 5-ingredient pizzas and home and tell me what your favorite toppings are! 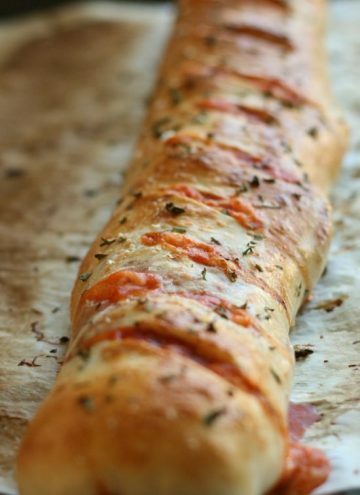 You're only 5 ingredients and 5 minutes away from a delicious dinner! 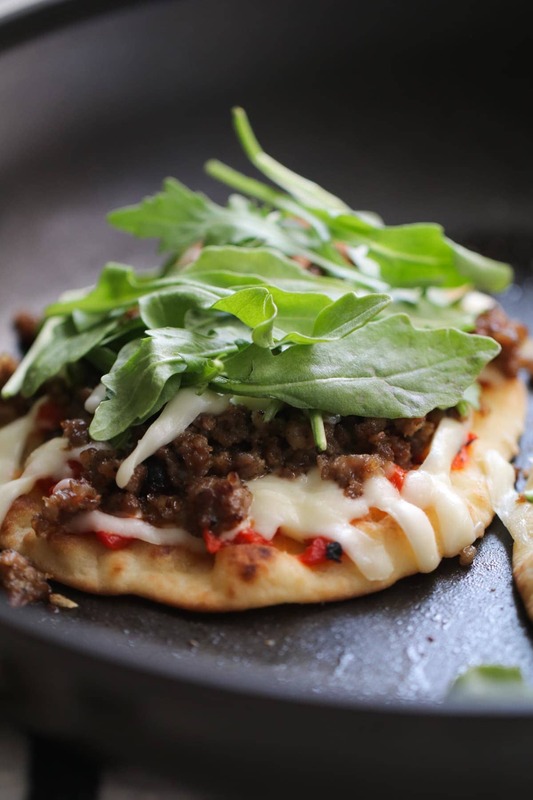 Toast up some mini naan bread and add your toppings for a tasty and super speedy dinner. Heat nonstick skillet over medium heat. Brush both sides of naan bread with olive oil and place two into the hot skillet. Lightly brown the bottom of the bread and flip. Reduce the heat to medium low and top each pizza with 1/4 cup roasted red peppers, cheese and sausage. Cover with lid to melt cheese quickly. Remove from skillet, top with arugula, salt and pepper. Cut in half and serve. *feel free to use marinara or pizza sauce in place of the roasted red peppers. Yum! I love naam. Gonna do this! Four stars since I haven’t made it yet! This is a great idea! 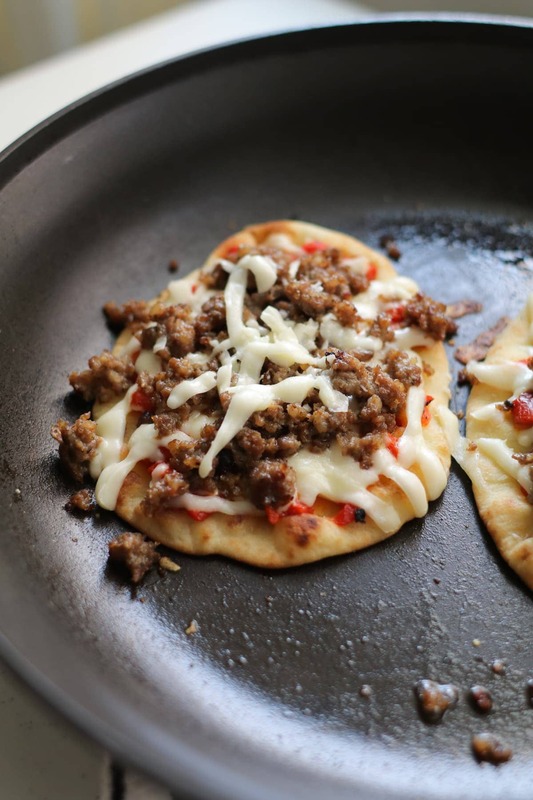 I’ve made naan pizzas plenty of times, but have never thought to do them on the stove top. These look so good and will be on our menu plan next week! 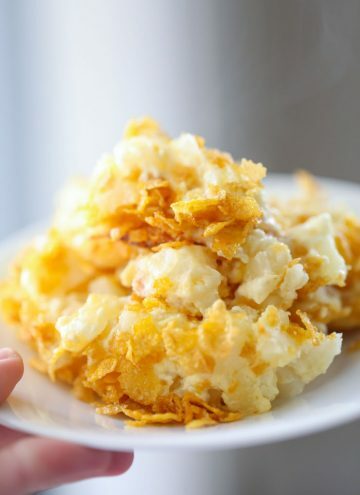 This looks delicious and super easy! Yum!! 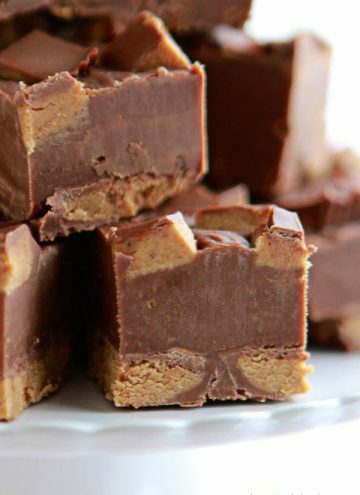 Looks easy and delicious! 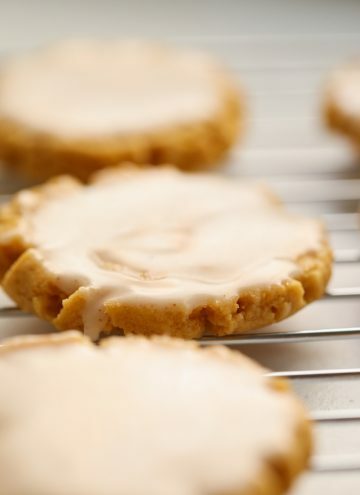 These look yummy and so easy! Thank you for a great idea!